We get a little excited about multitasking furniture over here at Babyology HQ and we loved the idea of the longevity of Perludi’s Otto in the Moon. It’s with great excitement we can announce there are now even more colours to choose from! We’ve already gushed about how the Otto in the Moon set up cleverly morphs from cot to a junior bed (fits children up to age eight) to a streamlined ottoman that can be used forever and a day. This beautiful contemporary piece is rich in texture, beautifully crafted using birch plywood and Austrian Loden pure new wool. Previously only available in grey, orange and sand, there’s now four extra colours – dahlia, black, blackberry and the sensational apple (pictured above). Whichever you choose, it will bring a fun pop of colour to the most minimalist of modern nurseries. 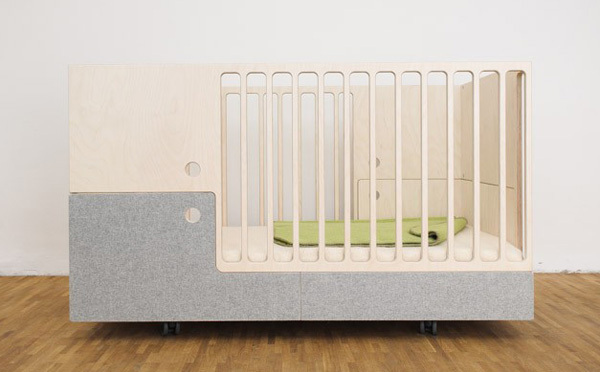 Otto in the Moon Crib kit is priced €265 and the Junior Bed and Ottoman base is priced €990, both available from Perludi.